Winning the Lottery Brings Misery, Loss, and Death - Why Bother? We often wish for things that we probably shouldn’t. I remember in middle school we were studying the middle ages and our teacher went off on a tangent about how little girls all say they want to be a Princess but what a horrible life it was. After all, Disney has about a dozen movies where the protagonist is a Princess and she lives happily ever after. The teacher went into the real life of a Princess which basically consisted of living in a cold, dark castle in an age of disease and pestilence where people are plotting to kill you and your husband despises you. She didn’t keep going into the details I understand now after reading more and watching movies and shows like The Tudors, The Other Boleyn Girl and others, but it is evident to me now, it’s probably not a life most present day American women would cherish. Life in the middle ages was miserable, especially for a woman. Are these just sensational anecdotal accounts? Not quite. While it’s a bit dated, there’s an oft-cited study showing that lottery winners were no happier than a control group – nor were they happier than paraplegics after a period of time. Seriously. Think about life with no arms and no legs. Then think about winning the lottery. How could they be roughly equivalent? Imagine a day where everything changes, everyone you know thinks of you differently, and everyone who wants to know you in the future is a suspect. When a distant relative wants to connect, is it authentic or do they want your money? When a woman takes a liking to you, does she like you or your money? When you go out to dinner with friends, who pays? After all, you’re rich now. But are you offending them by always paying? Should you help out every friend and family member who’s down on their luck? How could you not? Are you greedy? It would be a different life. Misery. Does This Make You Want to Go Buy a Lottery Ticket? Since When Does “Clipping Coupons” Mean You’re Poor? Saying this is to just make those of us who don’t win feel better. Come on, you know it’s true. @Financial Samurai, Hahaha! Nah, I never play. a) it’s a statistical waste of money. I’d sooner play blackjack at the casino with just a .5% house advantage. and b) I really do it would ruin our lives. When the mega was around $355 millions recently, I told my wife and friend that I don’t know if I would want to win. Of course they both thought that I was nuts. Years ago when the lottery was high, I thought–“what would I really want if I won the lottery?” And I wished for 3 things: Quit drinking, lose weight and learn Spanish. I’ve accomplished all 3 goals, but most important, I realized, “Wow, I could do that now and it wouldn’t cost a penny”. So what brings me happiness: Having enough, good health, and free time. Every day I thank God for my eyesight, this earth we live on, and whatever the hell else I feel like giving thanks for. Every day is an unfathomable miracle. Does having more money then we would ever need change what we already have around us? As a side note, one should always have a trust claim the prize thereby not having one’s name released to the public. @OP if you don’t want the money, just give it to me. Could be, I only know that my home state of Ohio allows it. Money doesn’t sole all your problems. But it makes feeling miserable about something (other than your health) a lot more t0lerable, even pleasant. 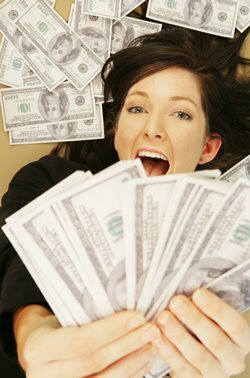 The money that big winnings provides frees up an enormous amount of time. The problem is that most people are not conditioned to handle the total freedom this newfound time surpus yields, that winning an immense lottery provides. That’s why work was really invented in the first place—to prevent insanity that comes with too much free time. Most shenanigans in this world arise out of too much free time, rather than too little. So lottery winners should logically be testd for their ability to handle freed0m of time. If they can’t then the prize should be tossed back in to the pool until the right person come along. I have been tested and with nothing to do all day, I still can’t find enough time to get it done in. I’d claim the winnings anonymously via some sort of lawyer mumbo jumbo and deal with consequences of being rich. I don’t buy tickets often, but sometimes I do splurge some of my fun money for $1 of hope, lol. Assuming it was just a couple of million, I *think* I’d be fine. I’d obviously claim anonymously. I’d then role the winnings into my portfolio, and have a bigger and more fun number to drive my investing. I only really intend to spend portfolio income anyway, with the possible exception of buying property. Where it might go wrong is if I felt the winnings were disproportionate to the money I’d earned and grown myself, and that it somehow undermined all those years of effort. That’s possible, I guess, but I’d be prepared to risk it!